Any new program requires a great deal of resources to realize innovations that fit the government’s guidelines and to co-exist with traditions that built the basis for the innovation. However, this process has been hardly recognized. The purpose of this chapter is to provide an insider’s account on the process of developing the new interdisciplinary degree program of social science to offer the curriculum partially taught in English at a private university. 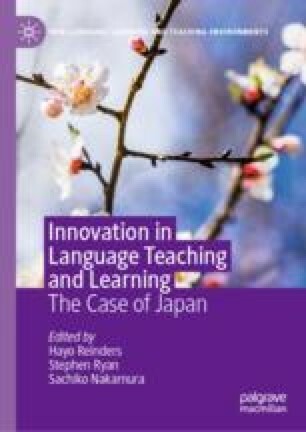 By elucidating the complexities of Japanese education system and the contextual factors, the author aims to help readers, especially practicing teachers, to understand some of the restrictions they might have faced in their own attempts to innovate or the restrictions they cannot be aware of until they have been involved in the actual process. MEXT. (2009). Quality assurance framework of higher education in Japan. Retrieved from http://www.mext.go.jp/en/policy/education/highered/title02/detail02/1373877.htm. MEXT. (2016). Heisei nijyu-hachinendo gakko kihon chosa kakuteichi no kohyo ni tsuite [Regarding the report on school basic survey 2016]. Retrieved from http://www.mext.go.jp/component/b_menu/other/__icsFiles/afieldfile/2016/12/22/1375035_1.pdf. Ministry of Internal Affairs and Communications. (2015). Joho Tsuhin hakusho heisei 27nendoban [White paper information and communications in Japan year 2015]. Retrieved from http://www.soumu.go.jp/johotsusintokei/whitepaper/ja/h27/html/nc121310.html. Obunsha Kyoiku Joho Center. (2016, August). Shiritsu-dai nyugaku teiin ware: 27nen yori nanakozo no 257 daigaku, 44.5% ni akka [257 private universities facing the insufficient enrolment, 44.5% worsened by 7 schools from 2015]. Retrieved from http://eic.obunsha.co.jp/pdf/exam_info/2016/0816_1.pdf. Yamamoto, N. (2017, April 28). Genkaidaigaku wa kieru! Shiritsudai teiinware no kozo: Sashisemaru 2018 mondai, sono chokuzen taisaku wa? [Borderline universities will disappear! The structure of private university insufficient enrolment: What measures to be taken for the fast approaching the 2018 issue]. Retrieved from http://toyokeizai.net/articles/-/169669.